The hip joint is a ball and socket joint, where the ball (femoral head) of the thigh bone fits into the socket (acetabulum) of the pelvic bone. 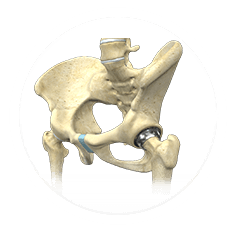 Femoroacetabular impingement (FAI) or hip impingement is a condition in which the bones of the hip joint grow abnormally, obstructing the perfect fit of the hip joint. This leads to restricted hip movement and increased friction between the joint bones, resulting in damage to the joint. FAI can be associated with labral tears, cartilage damage and hip arthritis. CAM impingement deformity: A condition where the head of the femur is not smooth and rubs against the socket. Pincer impingement deformity: In this condition, the socket has excessive bone growth and rubs over the femoral ball. Combined impingement deformity: This is a condition in which both CAM and pincer impingement deformities occur together. Femoroacetabular impingement occurs due to abnormal growth of the hip bones during the growing years of a child. Certain diseases can also lead to FAI such as Legg-Calve-Perthes disease (bone death due to lack of sufficient blood flow to the femoral head), slipped capital femoral epiphysis (separation of the femoral head from the thigh bone at the region of the growth plate) and coxa vara (femoral head and shaft do not grow at the same pace). Symptoms of FAI include groin pain, hip pain or low back pain. You may have severe pain while turning, twisting, squatting and sitting for extended periods, or experience a locking or clicking sensation within the joint. Physical activity and certain sports such as cycling, ballet, martial arts, golf, soccer, baseball and deep squatting bring about symptoms earlier. FAI can be associated with labral tears, cartilage damage and hip arthritis. Your doctor diagnoses femoroacetabular impingement by reviewing your medical history and performing a thorough physical examination of your hip, which usually includes an impingement test. For this test, your doctor will hold your leg and bend your knee towards your chest, rotating it towards your opposite shoulder. If this causes you pain, the test indicates impingement. Your doctor may also order imaging studies such as X-ray, computed tomography (CT) scan and magnetic resonance imaging (MRI) to confirm the diagnosis. Femoroacetabular impingement (FAI) can be managed with conservative and surgical treatments. Initial treatment involves resting, avoiding activities that increase pain, taking pain medications, and performing specific exercises to improve hip movement and strengthen the hip joint. If these fail, your physician may recommend arthroscopic hip surgery, a minimally invasive procedure to repair any labrum or cartilage tears, remove any bony bumps or trim off damaged or abnormal parts of the hip bones, facilitating free movement of the hip.